The White-faced whistling duck (Dendrocygna viduata Linnaeus, 1766) is a beautiful duck afferent to the group called “tree ducks”. It belongs to the order of the Anseriforms (Anseriformes), to the family of the Anatids (Anatidae), to the genus Dendrocygna and to the species Dendrocygna viduata. The name of the genus “dendrocygna” comes from the Greek “Dendron” = tree and from the Latin “cygnus” = swan and therefore means “arboreal swan” in reference to the arboreal habits of some of the species belonging to this genus and in reference to the peculiar look of these ducks which, in some way, do recall some small swans. The name of the species “viduata” comes from the Latin “vidua” = widow, in mourning in reference to the black-dark part of the livery. This species has a peculiar distribution being present in South America and in Africa (Madagascar included) and, in spite of the ample Atlantic separation, the two populations are not different genetically. Even if among the hypotheses done by the first naturalists there was that of the white-faced whistling ducks introduced in the New World by the slave traders, it is thought, more likely, that the species has colonized America from Africa by emigrating spontaneously through the Atlantic Ocean. The species frequents various aquatic and terrestrial habitats from the sea level up to the 8500 metres of eastern Andes. The species loves the humid zones and the open countries avoiding, normally, the forests and the woody areas. It is one of the most abundant African birds and is at times considered as a pest, due to its frequentation to the rice fields, in Western Africa. The African population, together with that of Madagascar, is estimated in being of 2-3 million of individuals. Tens of thousands of individuals gather in Uruguay and the species is very numerous also in Venezuela, Brazil, Bolivia and in Colombia. Nevertheless, the species is rare in parts of Costa Rica, and has totally disappeared from Panama since the first years of 1940. 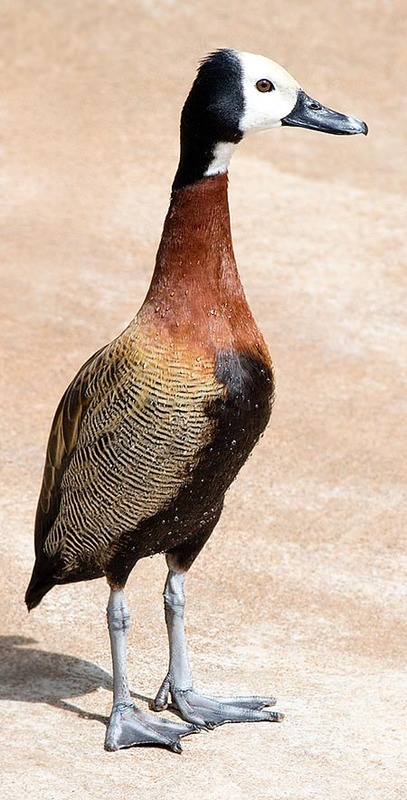 It is an about 38-45 cm long duck and has a weight of about 500-800 g. It has the classical shape of the anatids belonging to its genus, therefore: long neck and legs, rather vertical and slender habit, elegant and nice “off the ground” gait. The species is characterized by having the face amply white. This colour, continuing in the under-throat in an uninterrupted way or as spot after a black line, strongly contrasts with the black of the rest of the head and of the first portion of the neck. The white face, in some specimens and especially in the parts of the vertex, may be “contaminated” of yellowish. Also the wings, the rump, the thighs, the tail and the central part of the abdomen are black. The distal part of the neck and the chest are of a nice and bright brown reddish colour. The sides of the body are finely barred, proximally of cinnamon and of dull brown-black and then, going to the rear, of white and black. The dorsal feathers and the coverts are dark brown edged of slight brown-cinnamon. The sexes are similar. They have wide wings with which can perform accurate flights and effective tacking; the gait, when flying, is somewhat flickering, the flight is, on the contrary, not particularly fast. The wings have black remiges, great black-slate coverts and small coverts of the same lively brown of the chest-neck and gradually shaded in cinnamon-leather when going towards the trunk. All the under-wing feathers are black. The bill, of important size, is glossy black with a greyish sub-terminal belt (in some specimens there can be other greyish parts especially around the nostrils) and the legs are grey-slate. The eye is dark brown and has black palpebral fissure, seen from far away, the eye looks glossy black. The juveniles have greyish faces and the brown of the chest is duller. It is a rather calm species during the day; when looking for food it becomes more talkative. It has mainly crepuscular or nocturnal habits even if it feeds, especially in winter, also during the day. The white-faced whistling ducks are less prone in perching on the trees than other species of congeners; they spend most of the day idling, in great number of specimens, on muddy plains or sand banks. In common with the other species of whistling ducks has the fact of swimming following straight lines. Often, in South America, in the llanos do gather in immense flocks of thousands of specimens. In these locations, the species is so much confident of not even flying away in front of gunshots. This species often aggregates to group of similar species such as the Fulvous whistling duck (Dendrocygna bicolor) and the Black-bellied whistling duck or Black-belled tree duck (Dendrocygna autumnalis) even if the different species, inside the big flocks, tend to keep “sub-divided” in small conspecific groups. The white-faced whistling ducks at times stay, during the day, on the Indian Ocean beaches swimming also in the sea for crossing wide bays. The species may perform local movements looking for water, but it is not common that the movements done exceed the 200 km. When the white-faced whistling ducks are flying, they vocalize almost continuously emitting strong shrill and repeated whistles; when they fly during the night or at the twilight it is easy to hear the passage of flocks, without seeing them, just because of the continuous nice vocalizations. The members of the pair, and also more specimens at the same time, spend time in performing reciprocal sweet grooming on the head and neck by using their bills. This practice has also the function of strengthening the pair bonds and the bonds between the frequented specimens. 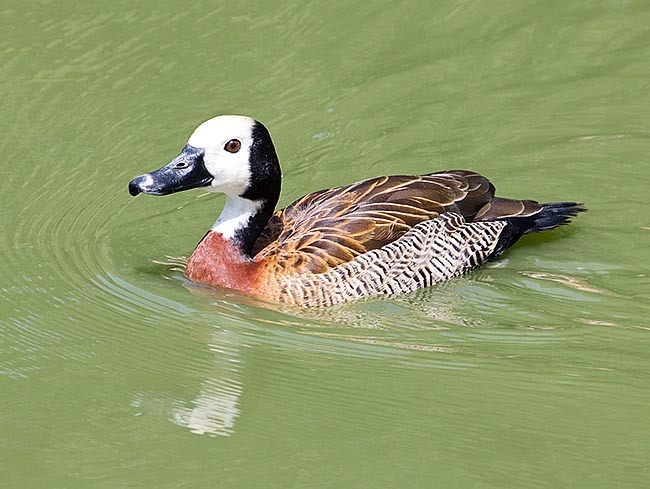 The white-faced whistling ducks usually reproduce during the rain season. The nests can be placed in hollows of the trees and of the ground, in low bifurcations of trees growing close to the banks or are usually well hidden and concealed in the tall grass or in the reeds. The nests can also be realized at a certain distance from the water or, more frequently, in swampy locations where the elongated swampy vegetation is lowered to form a sort of a protective dome of the nests themselves. The mating takes place in water even if at times when in shallow water, the ducks mate standing. The brood is formed by 8-15 rather roundish and white-ivory eggs. The hatching lasts about 24-25 days. The pair bonds are fairly stable and lasting. The ducklings have a brown-dark spotted livery alternated with yellowish-cream parts: the head ahs the vertex and a line crossing through the dark brown eyes, with yellowish eyelids, cheeks and neck. Pale-yellowish are also chest and abdomen. Yellowish are also 4 spots on the brown back, the sides and two lines of the wings. Both parents are very protective towards their progeny and tend to hide the ducklings in covered locations till when about 8 weeks old, period during which the acquire the capacity of flying. When a family of whistling ducks feels to be menaced, the chicks immerse and the parents beat noisily the wings over the water surface pretending to have a broken wing. This behaviour has the aim of trying to attract the attention of the possible predator on itself in way to distract the predator’s attention from the progeny. In South America, many eggs are predated by the caracaras and many ducklings are seized and eaten by Jabirus (Jabiru mycteria), Maguari storks (Ciconia maguari) and caimans. 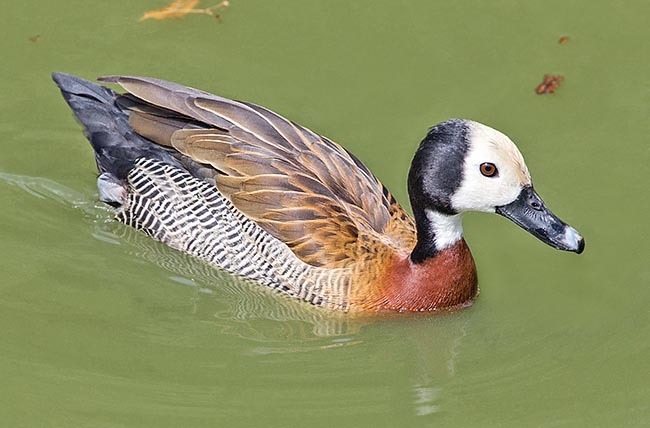 The white-faced whistling duck is very appreciated by the breeders and is fairly diffused in the aviaries and in the collection of the Old and New World. When in captivity, attention is to be paid because the various species of whistling duck may easily interbreed.